Sometimes desserts are simply better together. For example, chocolate and raspberries or ice cream and hot fudge. 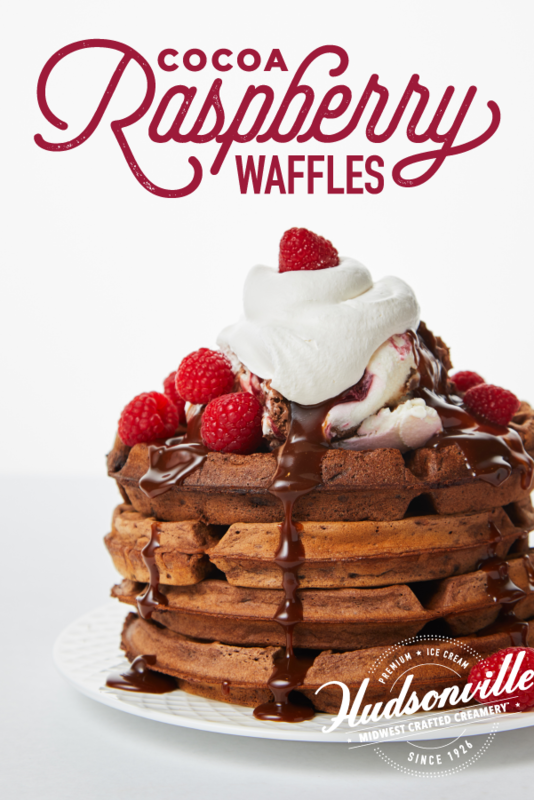 While these classic pairings are delightful on their own, we found a way to combine all of these timeless treats into one delicious dessert: Cocoa Raspberry Waffles topped with our Limited Edition Chocolate Raspberry Indulgence ice cream. Drop by the scoop onto hot waffle iron. Bake in waffle iron for 1 minute. Finally, remove from waffle iron and top with hot fudge, a drizzle of raspberry preserves, a scoop of Chocolate Raspberry Indulgence ice cream and whipped topping. Have you tried our Limited Edition Chocolate Raspberry Indulgence ice cream yet? With a delicious mix of dark and white chocolate ice cream and a natural raspberry ripple, this popular flavor won’t be around for long! Use our Scoop Locator to find a store that sells this flavor near you, and pick up a carton (or two) the next time you go grocery shopping. Then, show us how you’re enjoying our ice cream! Tag us in your pictures on social media using #HudsonvilleHappy. Who knows, maybe we’ll feature your recipe next!